Sophomore Jon Steele knocks the ball out of the Rhode Island catcher's glove to score the winning run in a 7-6 walkoff victory in May. After missing the playoffs by one game, the team hopes to build off a large returning class of sophomores to catapult themselves to the top of the Atlantic 10 standings. Freshman Jon Steele knocks the ball out of the Rhode Island catcher’s glove to score the winning run in a 7-6 walkoff victory Friday. It’s deja vu all over again for the baseball team, which gave credence to the old baseball adage in a three-game series sweep over Rhode Island this weekend, capped off by a complete game Sunday by sophomore pitcher Bobby LeWarne. Last season, GW won nine of its final 10 games to make the conference tournament for the first time since 2006. Now the Colonials are on the verge of making a late charge for the playoffs once again with just one series left to play. LeWarne called the weekend’s sweep “massive.” The Colonials also had help from Fordham, which is contending with GW for a playoff berth. The Rams dropped three games to Saint Louis this weekend to fall within a game of GW for the seventh and last seed in the postseason. The sweep sets up an exciting final week of play for the Colonials, who will go on the road to play last-place St. Bonaventure. Meanwhile, Fordham will face third-place VCU, which went 2-1 against the Colonials last week. “Right now we’re pretty much win or go home at this point with the conference tournament,” LeWarne said. The Colonials toed a fine line for much of the weekend, winning the series opener 7-6 in a 14-inning odyssey, and then earning a second walk-off victory 6-5 on Saturday. But the tune changed Sunday when LeWarne, who his teammates call “Bobby the Bull,” took the mound against the Rams. The right-hander threw 134 pitches through nine innings, surrendering three runs while striking out seven Rhode Island batters. “The bull met the ram and horns collided, and the bull won,” head coach Gregg Ritchie said. While the Colonials appeared to have zeroed in on their playoff hopes by the end of the weekend, the beginning of the series saw an unfocused GW team struggle early. Ritchie said it was the worst baseball his team had played nearly all year. 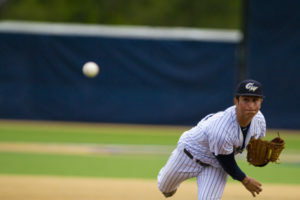 With senior ace Aaron Weisberg on the hill in Friday’s series opener, GW dug a 5-0 hole through the first four innings that appeared to have sunk the Colonials’ playoff hopes. But in the seventh inning, a fatigued Rams pitcher began to leave balls hanging over the plate. The Colonials capitalized, scoring four runs in the seventh, aided by a two-run, stand-up double to right field by freshman John Steele with two outs in the inning. Steele entered the game for a struggling Matthieu Robert, who had been bouncing the ball back to the pitcher. Freshman Jordan Sheinkop held the Rams scoreless for 4.1 innings of relief in Friday’s 14-inning victory. 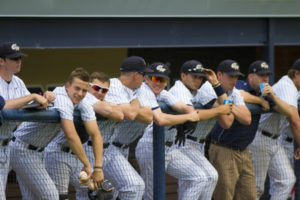 GW would only hold the lead for a short time as senior Colin Milon blew one of his only games of the year, taking the two teams into extra innings with the score tied at six. Freshman Jordan Sheinkop kept the Rams to three hits in 4.1 innings of relief, but was matched by the Rhode Island bullpen that held GW to just one hit between the eighth and the 14th inning. The second for the Colonials in the 14th inning would equate to the winning run. With Steele waiting on second base, freshman Eli Kashi smacked a single to left field. 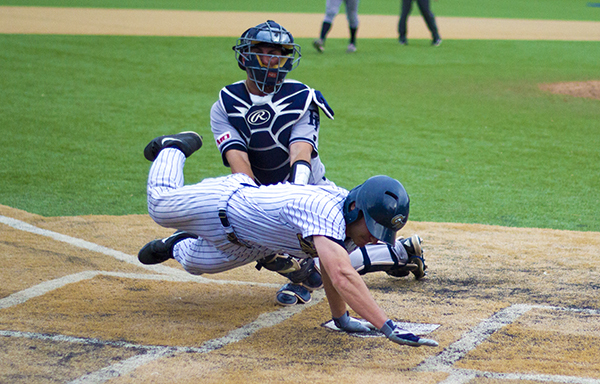 As Steele rounded third and headed for the plate he was beat by the throw, but contact at the plate caused by a diving Steele led to the Rams catcher dropping the ball and the Colonials winning the game. While Saturday’s game ended similarly in a walkoff, it didn’t last five hours. Freshman starter Jacob Williams threw 7.1 solid innings, allowing eight hits and three runs. Williams left the game with the lead, but was later credited with the tying run after the Rams amounted a hit off reliever Luke Olson. 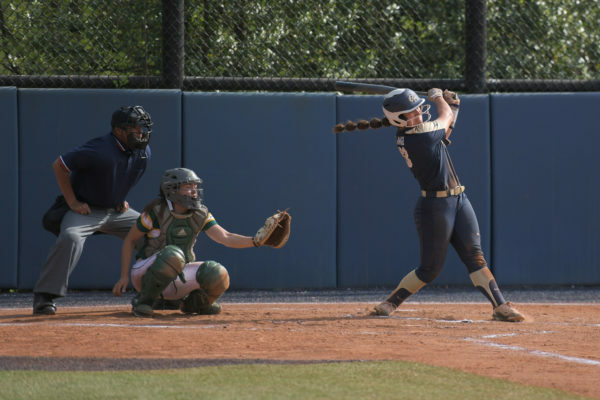 GW regained the lead in the eighth, but the Rams refused to go away easy, taking back control with two runs in the top of the ninth inning and giving themselves a one-run lead. The Colonials ended on top. A couple of miscues by the Rams combined with two runs on two hits for GW, including a game-winning single by freshman Kevin Mahala that gave the Colonials a 6-5. To keep playoff hopes healthy, though, GW needed a sweep. Weisberg said the back-to-back walkoffs from the weekend’s previous games gave the team momentum heading into the series finale. But even with the team riding high on two straight victories, Sunday’s matchup was not without its nail-biting moments. Toeing the rubber with a 4-0 lead in the third, LeWarne ran into some bad luck without the ball ever leaving the infield. A pair of errors and a single put him in a bases loaded, no-out jam. But despite trouble surrounding the Colonials defense, LeWarne settled down without surrendering a single run to the Rams. The Colonials’ playoff chances stay alive after a sweeping Rhode Island over the weekend. LeWarne would give up a solo home run in the sixth inning, but his other two earned runs came after a couple poorly executed situational balls and missed cut-off men by the GW defense provided extra opportunities for Rhode Island batters. Solid on the field for the Colonials, however, was freshman Bobby Campbell, who was sensational at third base. Campbell ranged to both sides and made strong throws across the diamond. Campbell said he was particularly focused with the game holding playoff connotations. Beightol finished the day hitless and saw his near-league leading batting average drop a bit during the series. On senior day, he was honored as the team’s MVP and recognized for joining the career 100 RBI club and entering the program’s top-10 list in hits with 230. Heading up to St. Bonaventure for a weekend series to close out the season, the Colonials will need a sweep to near-guarantee themselves a spot in the playoffs for the second straight season – but this year with one of the youngest teams in the country. Ritchie said as the team prepares for its final three games of the season, he expects his players to shed the youth label that has been held over their heads all season. The Hatchet misidentified freshman Jordan Sheinkop as “John Sheinkop.” We regret this error.